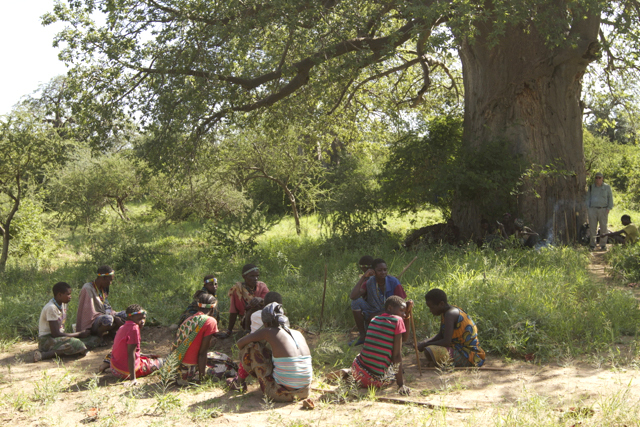 Hadzabe women waiting for the return of the hunting party. 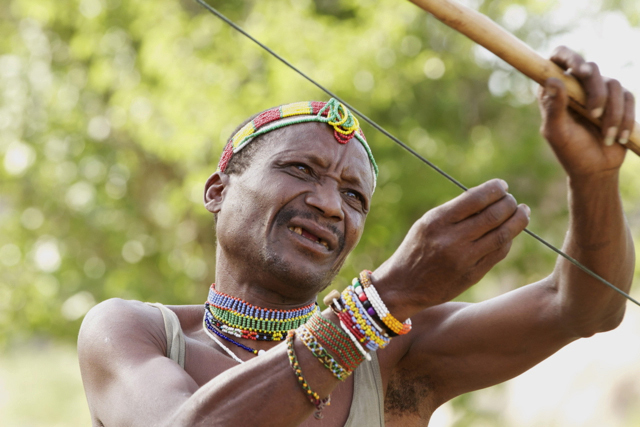 Hadzabe Man testing his bow. Making a Fire with friction sticks. 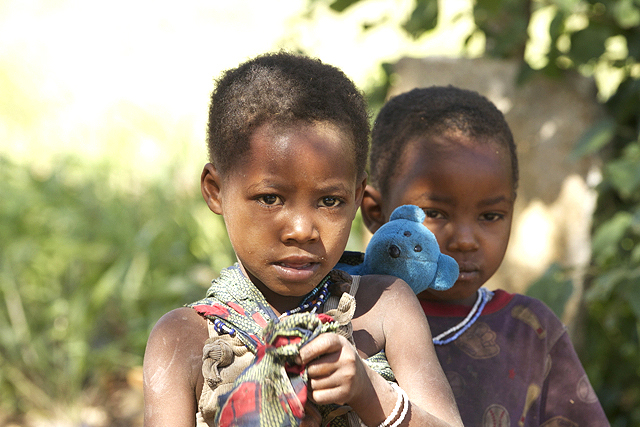 A Hadzabe Woman and Child. Hadzabe Child with "her baby" on her back. Chewing on roots collected and freshly cooked. 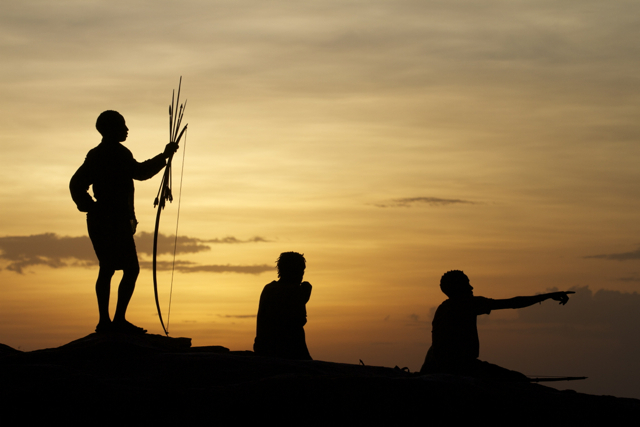 One aspect of an African safari that is often overlooked is the cultural side. 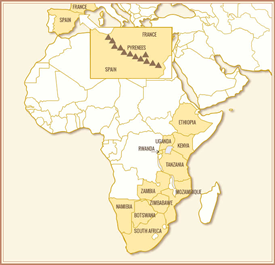 The primary reason for an Africa trip is usually the big game – lion, leopard, elephant and lots more of course! But over the years, I have noticed how activities that bring guests into contact with local people often turn out to be some of the most rewarding and memorable experiences of any safari. 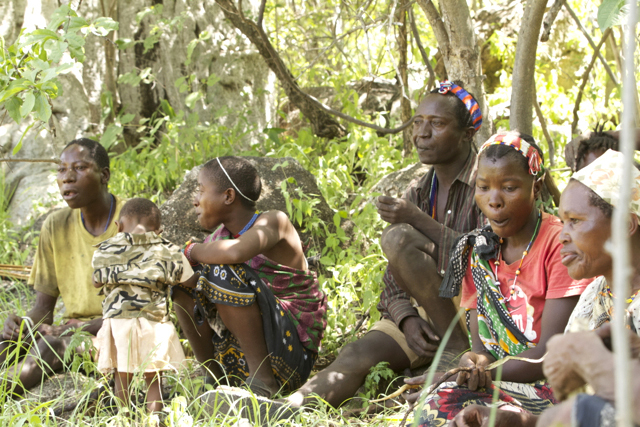 One of my favorite cultural groups is the gentle Bushmen (San) people of Africa, whose hunter-gatherer lifestyles and extraordinary sounding “click” languages define them. They are egalitarian, peace loving and respectful of others, and have an unparalleled knowledge of the environment around them, as their survival depends on it. 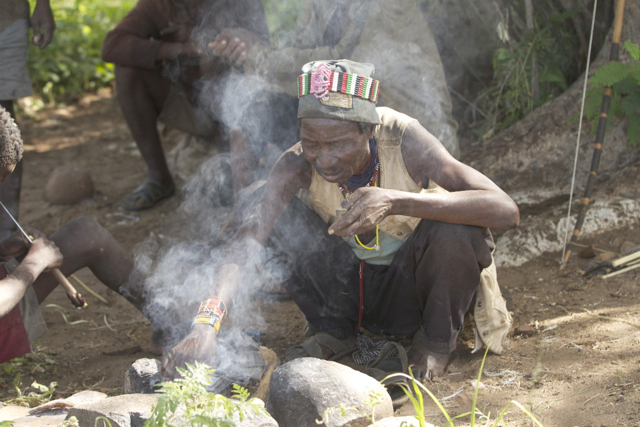 The Hadzabe of the Yaeda Valley in Tanzania are one such people. 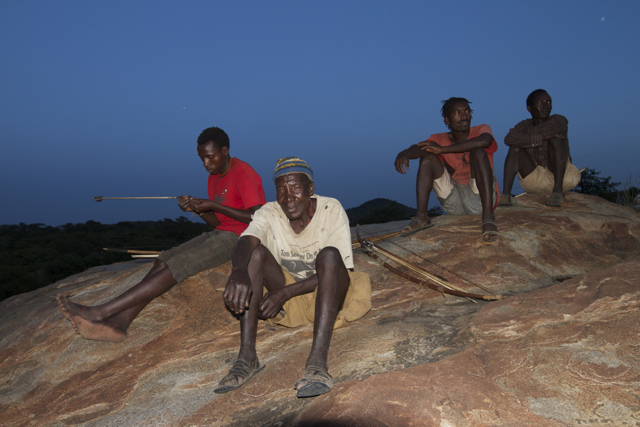 We recently spent three very memorable days with the Hadzabe and got a little insight into their daily lives. They live in basic huts made of sticks and grass or sisal plants, and their possessions are meagre – usually just a few plastic buckets or containers for carrying and storing water, a plate or two to eat crushed baobab seed porridge, a home-made axe and knife. Often someone in the community will have the basic tools needed to make arrow heads (these would be a hammer and a cold chisel). Pipes for smoking tobacco are fashioned out of a type of soapstone found some distance away and fire is made the traditional way – by rubbing two sticks together. 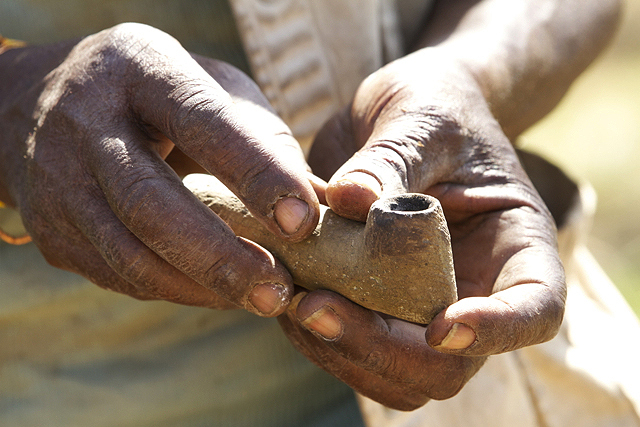 Their currency to obtain such precious things as hammers, chisels, nails and tobacco is the honey that they collect from the bush. Despite this, their lives seem fulfilled by living the lifestyle they love, which we saw as they welcomed us into their homes and smiled and laughed with us. Sadly, the wonderfully simple way of life of these people is in danger of disappearing forever, due to pressure from neighboring tribes. Competing agriculturalist and pastoralist tribes have moved into Hadzabe areas over the past 50 years. Farmers have cut down natural vegetation and fenced land to plant crops, in an area that is not well suited to such practices, sometimes resulting in failed crops. 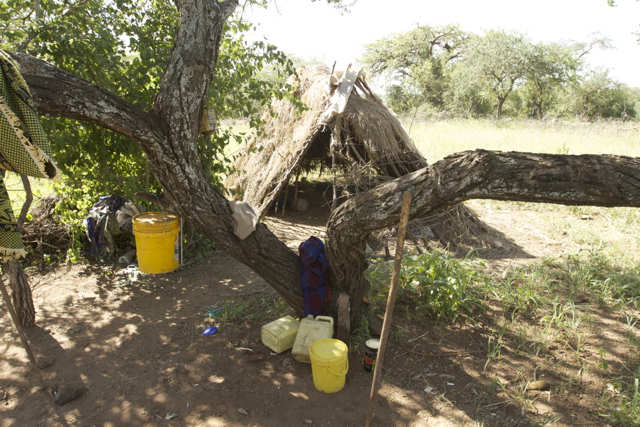 Pastoralists have disturbed wildlife while herding their livestock, and have enclosed waterholes and springs, limiting access to them by wildlife. This trend has left the Hadzabe people with a very marginal area to live in. Having very limited wildlife has made things difficult, since their daily sustenance comes from hunting wildlife and gathering honey and roots and tubers. Their nomadic lifestyle following wildlife movements is almost a thing of the past because of their confinement by other tribes. The Hadzabe are a proud people, who love their traditional way of life and hang onto every thread in an attempt to preserve it. It was an absolute privilege to spend three days with them, witnessing the most ancient human lifestyle of all, made all the more precious as I suspect it will not be possible to experience for very much longer. However, the time spent with these bush experts – digging for tubers, “helping” them hunt, watching them laugh, play and joke with each other, telling stories and dancing – is something that I will treasure.